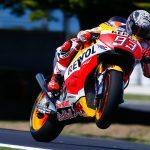 ​Miguel Oliveira (Red Bull KTM Ajo) was quickest out the blocks at the Malaysian GP, topping FP1 in the dry and FP2 then wet with slower laptimes. 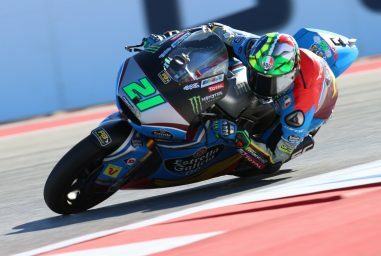 Oliveira was only 0.073 seconds ahead of points leader Franco Morbidelli (EG 0,0 Marc VDS), with title challenger Tom Lüthi (CarXpert Interwetten) within the same tenth in third. 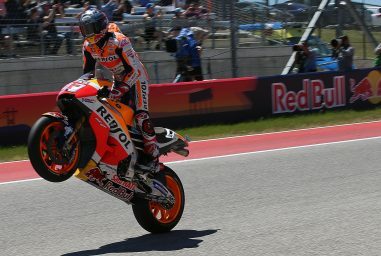 Tight at the top was a similar story in the afternoon in the wet, as Alex Marquez (EG 0,0 Marc VDS) took P1 – 0.034 ahead of Lorenzo Baldassarri (Forward Racing Team) and 0.065 ahead of Oliveira. 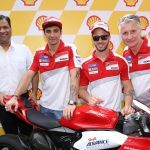 Overall however, Takaaki Nakagami (Idemitsu Honda Team Asia) was fourth quickest, with Mattia Pasini (Italtrans Racing Team) completing the top five. 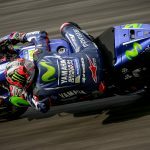 Isaac Viñales (BE-A-VIP SAG Team) took an impressive sixth, with Marquez in seventh. 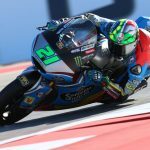 Fabio Quartararo (Pons HP 40) was top rookie, ahead of Sandro Cortese (Dynavolt Intact GP) and Baldassarri as the Italian showed good pace in both the wet and dry. Simone Corsi (Speed Up Racing) took P11, ahead of the first of the home heroes with Hafizh Syahrin (Petronas Raceline Malaysia) taking twelfth. 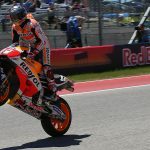 Francesco Bagnaia (Sky Racing Team VR46) – winner at the venue in Moto3™ last season – was P13 on Day 1, ahead of Axel Pons (RW Racing GP) and Xavi Vierge (Tech 3 Racing), who locked out the fifteen fastest. Vierge was also notable in the wet in FP2, taking P5. Moto2™ qualify on Saturday from 15:05 (GMT +8). 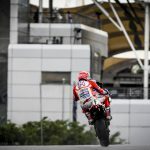 Joan Mir (Leopard Racing) was quickest on the combined timesheets on Day 1 of the Malaysian GP, with FP1 dry and FP2 a complete turnaround to full wet. The Majorcan was quickest in FP1 and with the weather changing remained unthreatened, with home hero Adam Norrodin (SIC Racing Team) the next man in line in second. 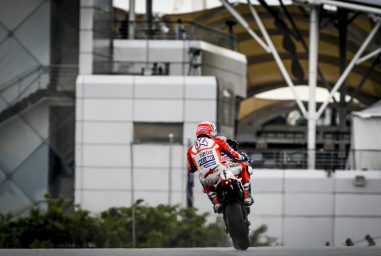 It was an impressive opening day for the Malaysian rider – riding for the Sepang International Circuit Team – as he also showed top pace in the wet in FP2; then just ahead of Mir. 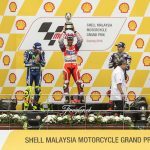 Fellow Malaysian rider, wildcard Daniel Kasmayudin, was another to impress in the afternoon – taking seventh in the wet despite a late crash. On combined timesheets however, Livio Loi (Leopard Racing) made it two Leopard Racing machines in the top three as he took third, ahead of Romano Fenati (Marinelli Rivacold Snipers) in fourth. Enea Bastianini (Estrella Galicia 0,0) completed the top five after a solid first session – and good pace in the wet. Bo Bendsneyder (Red Bull KTM Ajo) was sixth overall and second in the rain, with Andrea Migno (Sky Racing Team VR46) eighth overall ahead of Bendsneyder’s teammate Niccolo Antonelli. 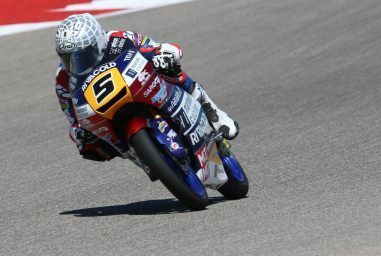 Jorge Martin (Del Conca Gresini Moto3) took P9, with Gabriel Rodrigo (RBA BOE Racing Team) completing the top ten. John McPhee (British Talent Team), Marcos Ramirez (Platinum Bay Real Estate), Nicolo Bulega (Sky Racing Team VR46), Manuel Pagliani (CIP) and Jakub Kornfeil (Peugeot MC Saxoprint) rounded out the fastest fifteen – with Aron Canet (Estrella Galicia 0,0) having a tough morning just off the top fifteen, but going fastest in the wet in FP2. Day 2 sees the lightweight runners qualify on Saturday, before race day could make history once again for Mir or Fenati as they chase the all-time win count.